The 1762 ‘Grand Exhibition of the Society of Sign Painters’ sought to mock the concurrent exhibition at the Society of Arts by placing signboards from the streets in a gallery setting and titling them with playful and facetious descriptions in its exhibition catalogue. Our 2018 ‘Grand Exhibition of the Pre-Vinylite Society’ features a global assembly of sign painters working directly from the 1762 catalogue to translate the historic descriptions into contemporary lettering and pictorial styles. 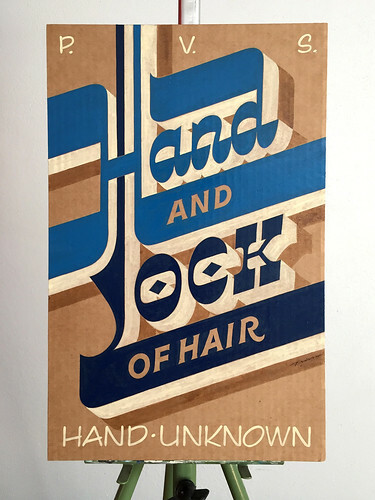 Each artist in the show has interpreted a description from the original catalogue by lettering it verbatim, rendering it pictorially, or by using both techniques to produce distinctive works that elevate the modern sign painter from craftsperson to artist. Alex May Hughes, All the World and his Wife. By Blackman. Enamel, gold leaf, mother of pearl, and butterfly wings on glass. 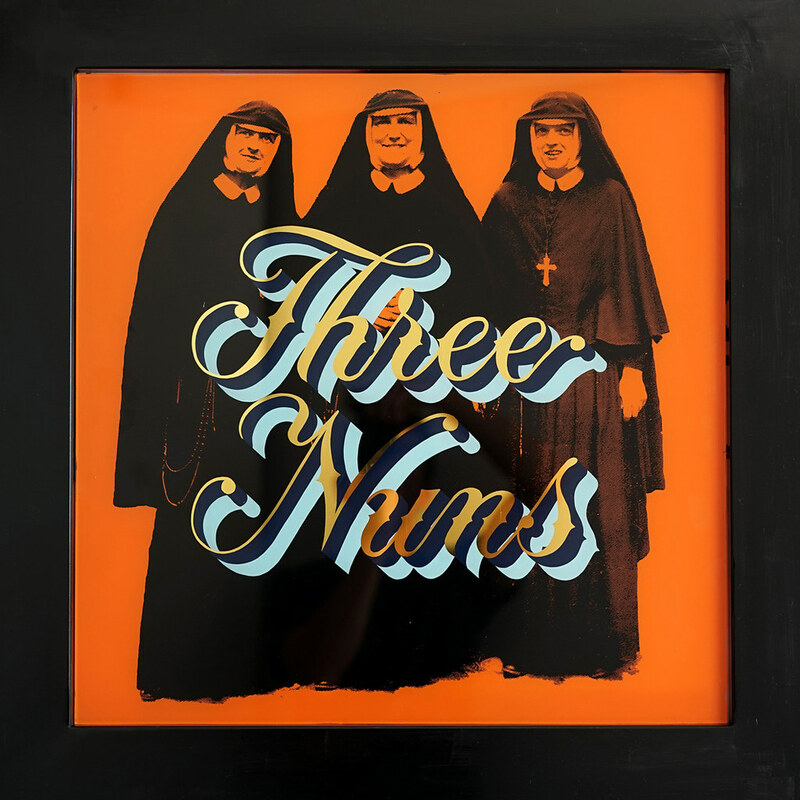 Top: Archie Proudfoot, Three Nuns. The Drapery copied from a Bas Relief at Rome. By Soames. Glass, gold leaf, steel and enamel. While our exhibition references the history surrounding the 1762 ‘Grand Exhibition’, it is not intended as a replication or reenactment of this historic event. 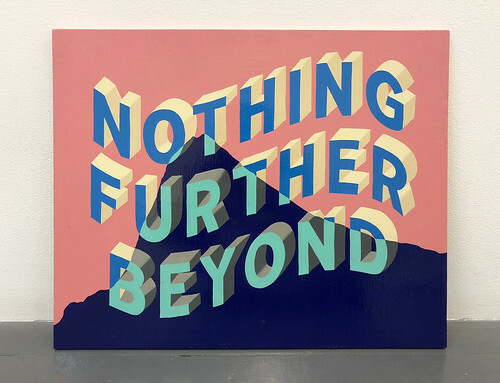 Instead, this show is a contemporary interpretation, or ‘revival’, celebrating the 21st-century global sign painting renaissance as an enterprise worth displaying in galleries. The satirical nature of the 1762 exhibition implies that, for the organisers, the presentation of street signs in a gallery setting was an anomalous act intended to provoke laughter among its attendees. Even in the 21st century, the craft of sign painting is rarely hailed as a gallery-worthy endeavor, perhaps because signs are semiotic objects: their value is attributed to the places they represent, rather than to the artistic object itself. The Pre-Vinylite Society holds the position that handmade signs should be considered art and in that vein, our exhibition is a rebuttal to the Society of Sign Painters’ implication that placing signs in a gallery setting is an act of absurdity. Carl Frisso Angell, Hand and Lock of Hair. Hand unknown. Enamel on cardboard. Dan Luckin, A Man in his Element. A Sign for an Eating-House. 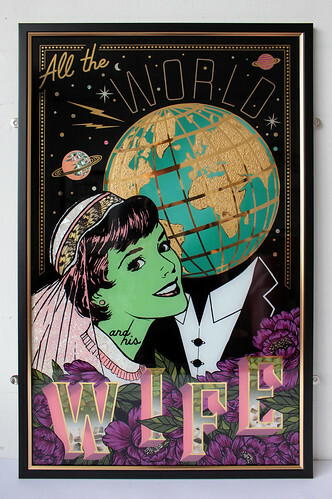 Acrylic, enamel, varnish, gold leaf, spray paint, and ink on wood. The contemporary interpretations on view in our exhibition vary from technical to conceptual, with several of the artists taking a hint from the satirical tone of the original catalogue to create profound and subversive works that exhibit the scope of impact an artistic sign can make. Without extensive knowledge of the politics and culture of the day, many of the descriptions in the 1762 catalogue seem absurd or bizarre, which allowed the artists freedom to interpret the words at will. The results are a medley of literal and figurative translations of the historic descriptions that demonstrate both the mastery of technique and the cultural consciousness apparent in our 21st-century international sign painting renaissance. 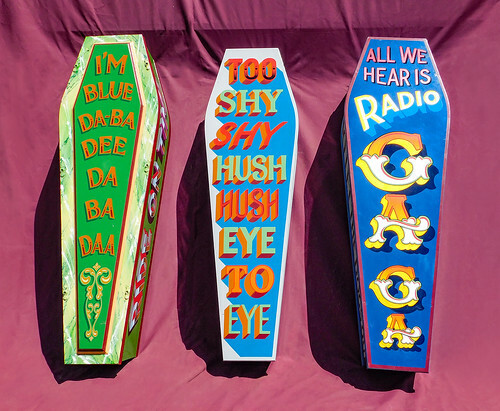 The array of technical skill and conceptual acuity in the ‘Grand Exhibition’ makes for an eclectic exhibition that advances the possibilities of what a sign – and a sign painter – can be. Joby Carter, Three Coffins, its Companion. Finished by Shrowd. 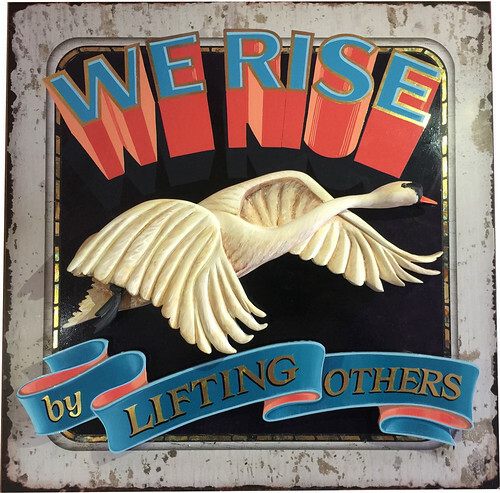 Enamel on wood. Shelby Rodeffer, The Good Woman. A Whole Length, but no Portrait. By Sympson. N.B. It is done from Invention, not being able to find one to sit for it. Satin, mirror, thread, lucite, acrylic, fabric gimp braid, and fringe. Rachel E. Millar, The Hercules Pillars. The Architecture by Young Soames. The Figure (from the Farnesian Hercules) by the Father. 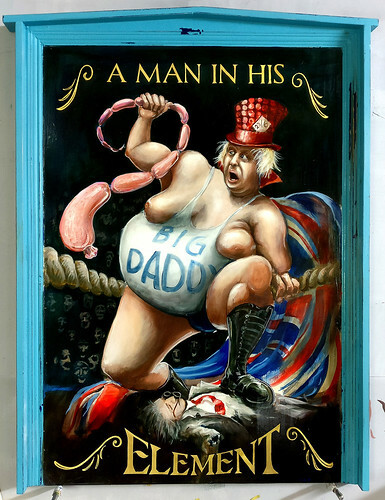 Enamel on wood. In the 256 years since the men behind the Society of Sign Painters’ exhibition used the medium of signage to express their varied views on eighteenth-century London life, many things have changed, but sign making has remained an integral method of public expression and demonstration. 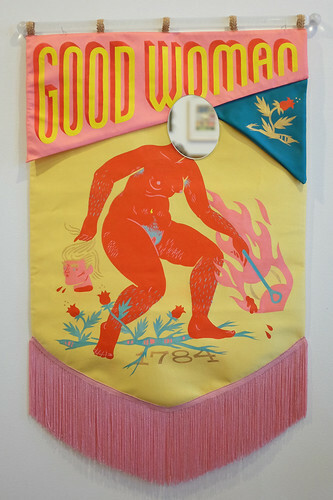 As a response to the historical event, the ‘Grand Exhibition’ aims to celebrate sign painting as a gallery-worthy art, to champion the international community of sign painters as artists, to encourage more diversity in this field through education and inclusivity, and to use our art as a tool to resist the onslaught of mass conformity. Tom Collins, in collaboration with Dorothy Cross, Fergal Lawler, Niki O’Connell, and Joe Lane, The Irish Arms. By Patrick O’Blaney. [N.B. Captain Terence O’Cutter stood for them.] Wood, gold leaf, Apple iPad, film/audio headphones, laser-etched and tempered glass. 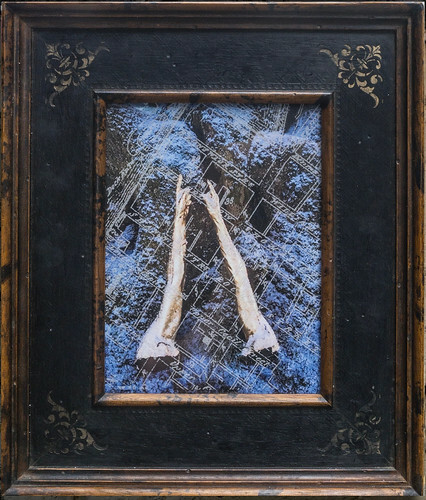 Liane Barker, A Flying Swan; – by some supposed to be a Dying one. By Goustry. Enamel, gold leaf, relief-carved foam and hand painted swan, variegated leaf on raised timber panel. ‘The Grand Exhibition of the Pre-Vinylite Society: An 18th Century Revival’ is part of ‘Letterheads 2018: London Calling’ on the first floor of the Bargehouse, Oxo Tower Wharf, London SE1, UK. The exhibition is open to the public at 11am–6pm (Thursday to Saturday, 16–18 August) and at 11am–4pm (Sunday 19 August 2018). Curator Meredith Kasabian will be giving public talks at the gallery at 1pm each day. 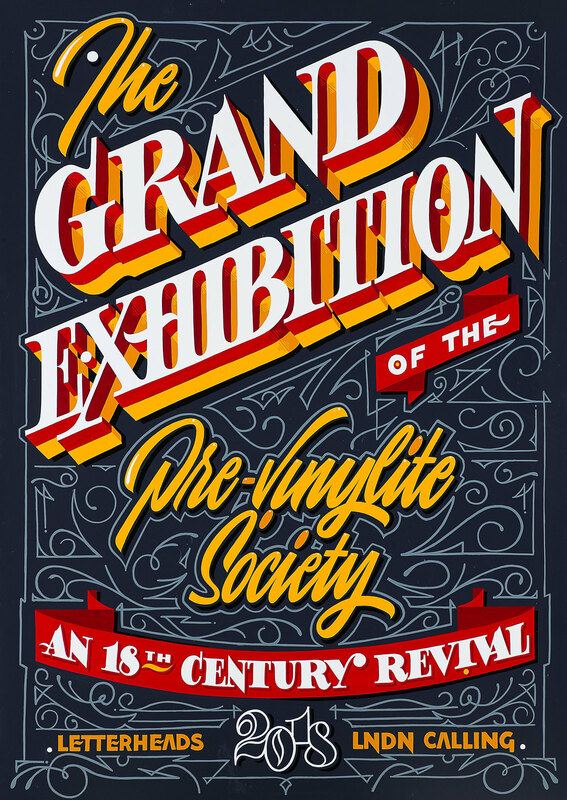 Catalogue cover for ‘The Grand Exhibition of the Pre-Vinylite Society’ designed and painted by Jakob Engberg of Copenhagen Signs, 2018.